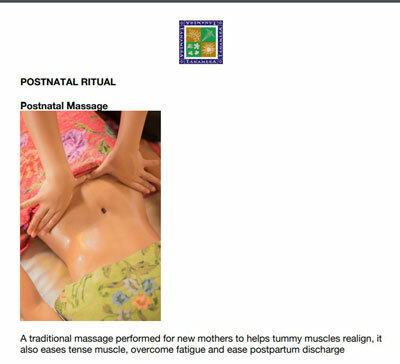 Tanamera postnatal care set has been designed according to traditional Malay after birth therapies, which have helped new mothers cope with the stress after delivery for hundreds of years. Such traditional products are a ritual, as they help soothe and calm the mind, which enhances recovery. The elements of each product are 100% formulated from plant-based ingredients. 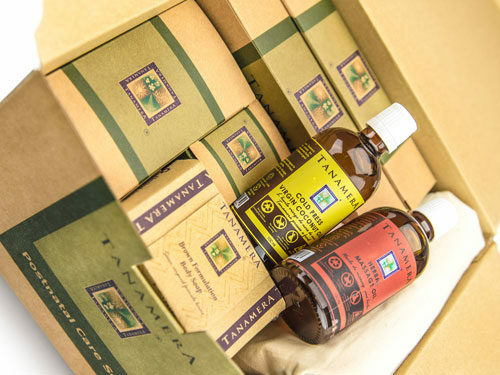 Always championing the cause of great personal care for all, Tanamera introduces the Postnatal Care Set for new mothers to integrate into the traditional Malay self-care rituals during the 44 day confinement period. This 10-piece set focuses on restoring both body and mind ofthe new mother. She starts her new life of motherhood on the right foot by taking care of herself and healing her body, so she can be an effective and doting mother to her baby. Because when mummy is well and happy, so is baby! Cold Press Virgin Coconut Oil (100ml) — this food-grade item is used for preventing stretch marks prenatally, or fading stretch marks postnatally, when applied to the skin directly It can also be consumed as it works from the inside out, being high in antioxidants and which helps to lower cholesterol, lose weight, and reduce risk of heart disease. Herbal Massage Oil (100ml) — made from a palm oil base, this miracle oil is a blend of clove, citronella, ginger, nutmeg, garlic, onion, and turmeric that helps to restart the new mother’s internal circulation. 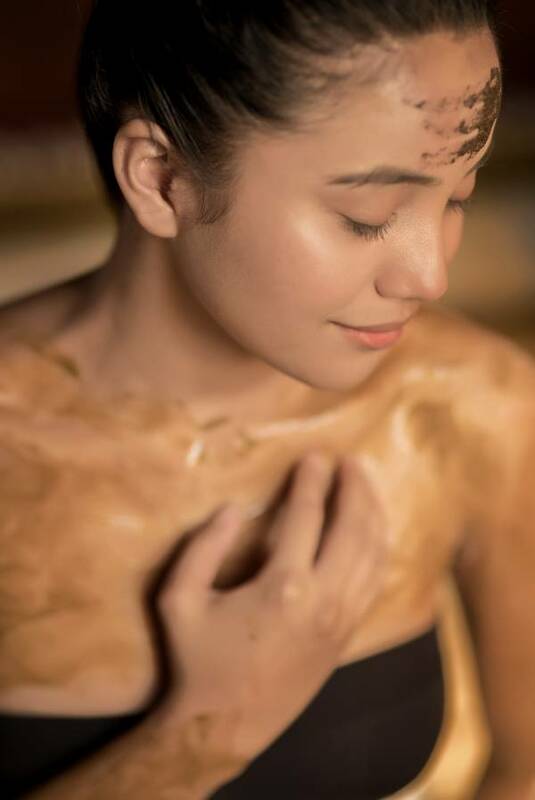 When applied to the skin, the warming sensation caused by the combination of herbs helps stimulate blood circulation and metabolism, as well as removing toxins from the body, skin toning, releasing water retention, and also keeping skin smooth and supple. Pour a small amount into the palm of your hands and rub together to warm it up before you apply to the skin (and avoid getting it on clothing as it may stain). Brown Formulation Soap (125g) — an excellent exfoliant and Tanamera’s bestselling soap. Made with a combination of herbs like ginger, turmeric, cinnamon and vetiver, and grains to create a gritty surface that helps with removing dead skin effectively. It’s both anti—inflammatory and antibacterial that can help with improving circulation. Herbal Bath x 14 (1 09) — refresh and reenergise with a highly aromatic combination of lime, citronella, turmeric, and nutmeg. Just boil one sachet in two litres of water for 20 minutes, and add to warm water in a bathtub and soak (or use for a sponge bath). Each sachet can be used twice. Calming Herbal Blend Paste x 4 (3g) — slick on this paste of black seed oil and herbs to refresh tired eyes and mind and gain a little clarity. Add one teaspoon of hot water to one packet and mix powder into a thick paste, from day five of confinement onwards. Find a quiet place to lie down and apply to the forehead and leave for 60 minutes before washing it off. Firming Herbal Blend Paste x 14 (150g) — for cleansing, toning, and reducing the appearance of stretch marks around the stomach, this herbal blend of cinnamon and ginger root stimulates blood flow and reduces water retention. Add powder from one sachet to four tablespoons of hot water and mix into a paste. Spread evenly over stomach and cover with a thin cloth before using the abdominal binding, and bind for at least half a day, then rinse off. Recommended to use from day three onwards. Consult with your doctor first before using this after a Caesarean birth. Boreh Body Scrub x 4 (20g) – this natural heat therapy body scrub contains ‘warming herbs like ginger, pulasari wood, nutmeg, cinnamon, pandan leaf, and lime, to increase circulation and reduce muscle fatigue, and is also an effective exfoliant. 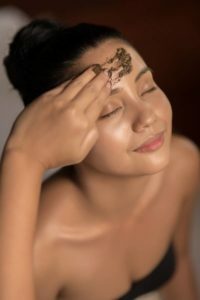 Use twice a week from day five onwards by mixing one sachet with three tablespoons of hot water to create a thick paste Apply all over the body, then wait until it is half dry before you rub it off in gentle circular motions with your hands like a scrub, then rinse off the excess. Herbal Tea x 14 (2g) – a soothing cup to tea to heal you from the inside out, this herbal blend is meant to speed up the healing of the womb, facilitate the discharge of blood clots from the uterus after childbirth, warm the body and improve circulation, and also help with reliving constipation. Brew one sachet in one cup of hot water for five minutes, twice a day with meals (breakfast and dinner is recommended) for 14 days. Abdomen Binder – because Tanamera believes this is an important element of the Postnatal Care Set, the bengkung is included for free and is exclusive to this set. The binder is based on a traditional design aimed to give full support to a woman’s postnatal body. Made from unbleached cotton, the binder is soft yet durable, and can be worn for hours in absolute comfort (even under loose clothes). It fits under the bust and extends to below the buttocks to release water retention, firm up a flabby tummy, recovery of the abdominal muscles and tissues, toning stretched skin, supports back posture during breastfeeding, and encourages the cervix to shrink to its pre-pregnancy size. Apply the Firming Herbal Blend Paste to the stomach first, then wrap the binder around your torso and lace yourself in, tightening the cord for a snug (but not too tight) fit after every loop. For Caesarean births, wait until stitches have been removed and consult with your doctor. The bengkung can be used from day three onwards, for 40 days. Tanamera recommends using these items between 14 and 40 days, some can even be used immediately at the hospital following delivery the sooner you start, the better the results will be. 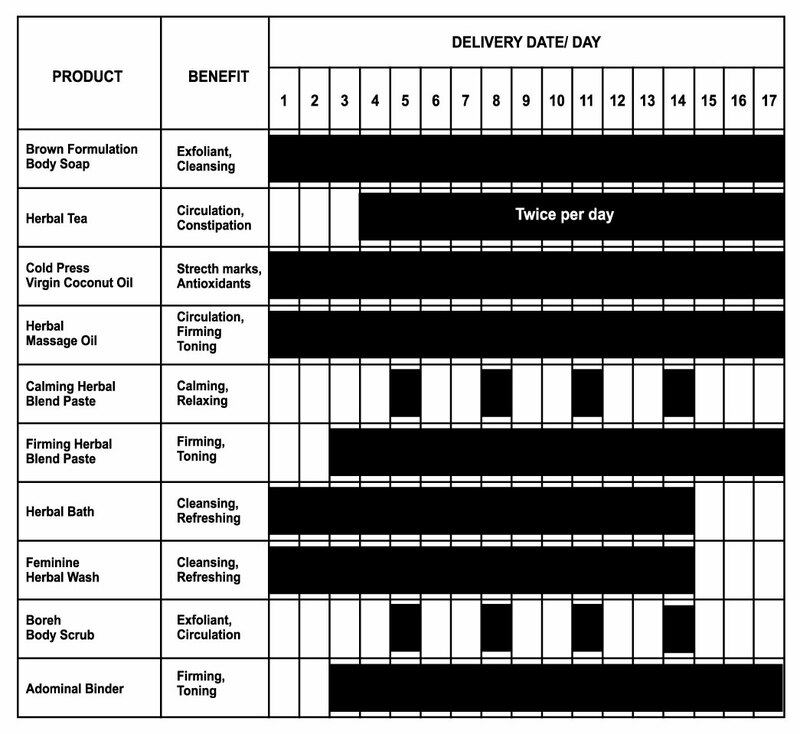 The chart below will guide you on how often to use each product. 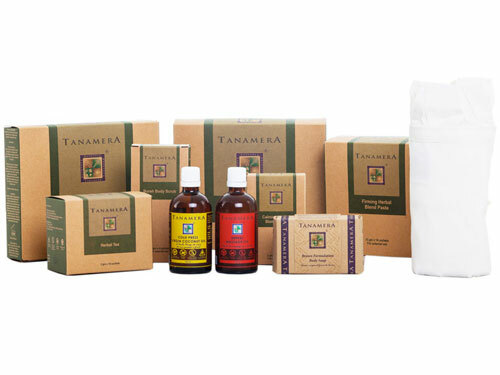 Founded with the commitment to offering fully natural and eco-friendly products, Tanamera has become a stalwart in the natural products market since 2000. All items in their home, travel and professional spa range are made from natural plant ingredients, with raw materials sourced from the rich soil of our tropical rain forests. They contain zero artificial colouring, perfumes, chemical actives or preservatives, and they’re full of everything that is good for you and your body. And they’re perfect for the Asian tropical spa treatments they were inspired by.